It’s hard to believe that someone could make a film called MEAT about the animals we breed, husband, hunt, butcher and devour and not be pushing an agenda. But that’s exactly what filmmaker David White has done. His feature-length documentary, billed as “the modern story of the animals we eat”, introduces us to three farmers and a hunter going about their daily lives while talking about their relationship to animals. White, 34, who is in possession of a magnificent, unruly mane and a pair of nerdy glasses, looks, by his own admission, like a Wes Anderson character – which is to say, not an awful lot like a country boy. But a country boy he is. He spent his childhood, along with five siblings, on their fourth-generation sheep and beef farm in the Hawke’s Bay and is well acquainted with the realities of farming. It’s also where he wrote MEAT. He believes the connection between consumption and production is being lost and even in a country the size of New Zealand, many people do not understand where their meat comes from. MEAT takes us into the worlds of Ian the South Island commercial pig farmer who produces 400 tonnes of pork a year and has been farming for nearly 30 years; Jill, a former police officer who runs a lamb and beef farm in the Manawatu; and Tony, a retired teacher and accidental chicken farmer from Whanganui, who admits he could legally double the number of chickens he keeps but resists as “the conditions would be terrible”. The documentary, which recently landed an international distribution deal, is beautifully shot and unflinching in its imagery: think dead lambs, plucked chickens, cows having their throats slit and Josh rifling through a deer’s lungs to look for lesions and nodules (a sign of TB). It also offers some interesting insights into the realities of commercial farming. This is just one example, says White, of the complexity of food and why we consume what we do. “That there’s a whole part of society that obviously thinks: ‘The way to get out of my situation is buy less quality food and to buy a Lotto ticket.’ And that’s insane to me. But I can’t tell you what to do. I don’t know your situation. I don’t know how much money you make. I don’t know how many kids you have. Just when you think you might have reached your limit of watching animals in cages, barns, crates, trucks and tied to the side of 4WDs, we are brought back to Josh stalking about in the forest, climbing trees and nipping up mountains, like a palate-cleansing bush MacGyver. “I am a little bit concerned about my offspring,” he says while squatting by a fire. White, who can most definitely start a fire, returns often to the family farm, now run by his sister and brother-inlaw. “It truly is a place I love dearly.” And it’s probably down to a combination of his farming background and genuine neutrality that he has managed to gain access to a commercial piggery, often notoriously private places – the result of relentless negative PR. White says he does eat meat, which is primarily home kill from the family farm. “I actually get a phone call every few months saying: ‘What can we get you?’ He keeps a deep chest freezer in his Wellington office and “half way through the day I might go, ‘What am I going to eat today?’ and I will get it out and defrost it on the deck outside my office”. MEAT is White’s third film looking at the way we consume animals. Two short films: I Kill, about a mobile slaughterman, and Oink, which was Ian the pig farmer’s film debut, preceded it. But even so, White says there was still more he wanted to learn about meat production. 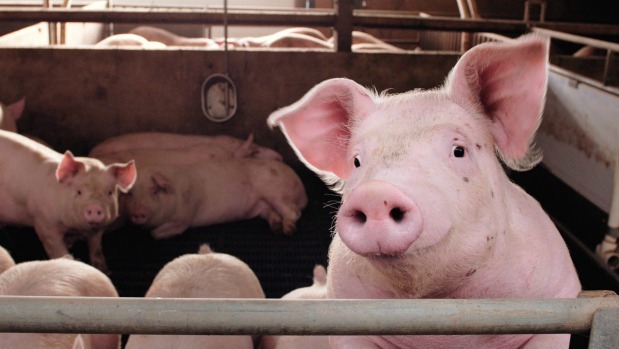 There is a scene in the film where Ian, surrounded by hundreds of squealing pink piglets, talks about how frustrating food waste is for farmers. A South Island commercial pig farm and a lamb and beef farm in the Manawatu are two of the four scenarios in White’s film MEAT.